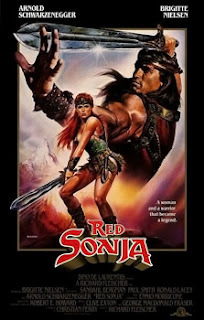 Tag line: "A woman and a warrior that became a legend"
Some very talented people were involved in the making of 1985’s Red Sonja, a fantasy movie based on a character that appeared in Marvel Comics’ Conan the Barbarian series. For one, it was directed by Richard Fleischer, who helmed The Vikings, Fantastic Voyage, and Soylent Green, among others, and the score was composed by the great Ennio Morricone (The Good, The Bad and the Ugly, Once Upon a Time in the West), who won his first Academy Award a few days ago for his work on Quentin Tarantino’s The Hateful 8. Then, of course, there’s co-star Arnold Schwarzenegger, who, along with playing the title role in Conan the Barbarian, had also appeared in James Cameron’s The Terminator. By all accounts, Red Sonja should have been, if not a great motion picture, at least watchable, and mildly entertaining. Well, to be fair, it is watchable, but “mildly entertaining” might be stretching things a bit. The film opens with a flashback sequence, which reveals how our hero Red Sonja (Brigitte Nielson) lost her entire family when troops loyal to the evil Queen Gedren (Sandahl Bergman) ransacked her home (the Queen was angry that Sonja had rejected her sexual advances). As if murdering Sonja’s kin wasn’t bad enough, the Queen and her minions also eventually swipe the Talisman, a relic so powerful that it makes whoever possesses it invincible (fearing its strength, the band of priestesses watching over the Talisman were actually trying to destroy it when Gedren’s army attacked). Hoping to avenge the deaths of her loved ones, Sonja sets out to locate the Talisman and, in the process, kill the Queen. Joined by the mighty warrior Kalidor (Schwarzenegger), as well as a pint-sized Prince (Ernie Reyes Jr.) and his faithful servant (Paul Smith, aka Bluto in Popeye), Sonja eventually makes her way to the Queen’s castle, but can she destroy the Talisman, or will the entire world fall victim to its awesome power? Perhaps the most glaring issue that plagues Red Sonja is the performance of its star. Delivering her lines as if she was made of wood, Neilson is never once convincing in the part (the action scenes are even worse; in practically every battle, it looks as if she’s struggling to just hold her sword, let alone swing it). In addition, the character of the child prince, played by Ernie Reyes Jr., is annoying as hell (I know he was supposed to be arrogant, but still…), and the way Arnold’s Kalidor usually turned up out of the blue, and always at just the right moment, was more comical than anything (originally, Schwarzenegger was signed for a brief cameo, but his role was expanded, making him a top-billed co-star). Of course, the actors aren’t the only problem; the battle scenes are lifeless (a major skirmish between the Queen’s troops and the Priestesses guarding the Talisman had no energy whatsoever), and for a fantasy movie, Red Sonja displays little imagination (I liked the skeleton bridge that hung over a crevice, and the water serpent made of metal was kinda neat, but aside from that, there wasn’t anything fantastic about this world or the people in it). In short, it’s a stinker all around. Even in the pantheon of mediocre ‘80s fantasy films, Red Sonja manages to distinguish itself as a particularly bad movie. You're taking me back, Doc! Your review makes me wonder if I'm remembering this movie with nostalgia goggles on. I remember liking it a lot.